Simon Kuznets Kharkiv National University of Economics is the leading higher education institution of the Eastern Ukraine, which provides a full range of educational services, carrying out multistage training, retraining and upgrading experts’ skills in 15 specialties, such as Economics and Entrepreneurship, Management and Administration, Information Systems and Computer Science, Publishing and Printing Business. 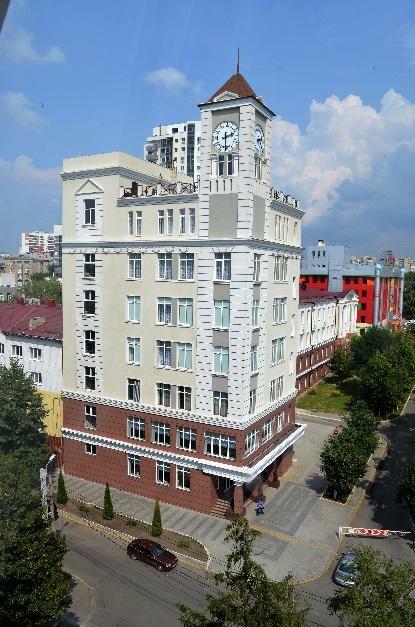 Simon Kuznets Kharkiv National University of Economics has about 7700 students (including 800 foreign students), 650 faculty members and offers training primarily structured around the new teaching architecture of the higher education. Having a considerable experience in training Ukrainian students, KhNUE influences HR, scientific, technical and economic policy of industrial enterprises and organizations in the country. The University trains highly skilled economists familiar with modern information technologies and innovative model of behavior. The University established a flexible system of quality specialists preparation management, based on continuous monitoring of KhNUE graduates’ achievements. The GEP Progress Report is a brief summary of the activities and the interesting events that have taken place during the first implementation period. 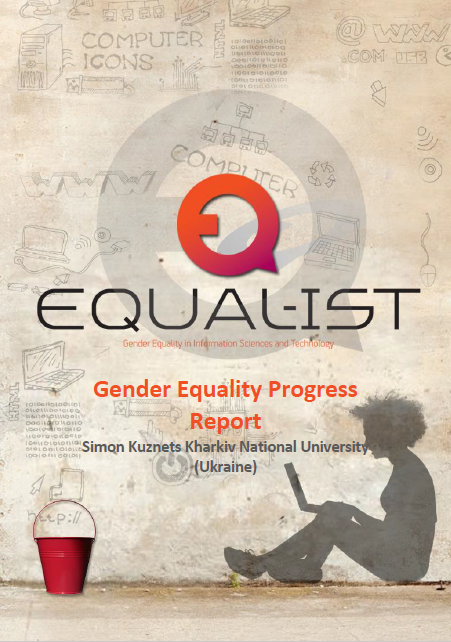 The Report can be also used as an introduction to the Updated Gender Equality Plan that is currently under implementation. You have already downloaded this file. Based on the assessment activities, the RPO has developed a tailored GEP that considers and addresses the local strengths and weaknesses. The design and development of the GEP was discussed among all RPOs involved in the project and was further supported by an online crowdsourcing platform that has ensured the participatory design of GEPs and the maximum diffusion of knowledge among partners and stakeholders (academic staff member, gender experts, students, etc). The GEP is now in the process of implementation. 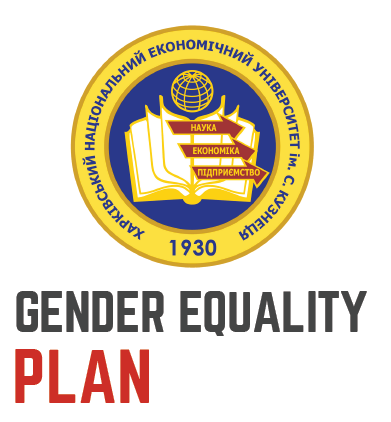 Here you can access the updated version of the KhNUE Gender Equality Plan. The Plan was revised based on the outcomes of the 1st iteration of the GEP implementation and the feedback from the external evaluator of the EQUAL-IST project. On this document, you can find the identified challenges for KhNUE and the complete action plan that was formulated to address them. Simon Kuznets Kharkiv National University of Economics (KhNUE) is the biggest economical university on the east part of Ukraine. There are totally about 1350 persons in the staff of the university and between staff, we have 68% women and 32% men. There are 716 persons in academic staff where there are 62% women. at KhNUE. Recent data on employment at the university show that the administrative area is characterized by a prevalence of women. There are 13,000 students (56% female students and 44% male) are currently enrolled. At the Information Systems department, there are 30% (12 out of 41) of academic female employees, 39% of female students in the undergraduate programme and 43% – in the graduate programme. In 2015 totally 92 students joined to the Information Systems Department, totally 31,9 % women and 69,1 % men. Disaggregated data on the academic members show that on IS department level the female presence decreases passing from the category of lecturers to highest positions of associate professors and full professors. Regarding the non-academic employees, Information Systems department personnel consists of 20 women out of 66 (30%). Almost all secretaries are female. Oleg Rudenko – Head of Information system department, professor, Doctor of science, male. Great interest towards research of IS; Key person in the decision-making process at IS department. Head of the working group. Larisa Mogilevskaya – Head of HR department, female. Key person in the HR decision making process at University; She determines the policies and procedures for recruitment and personnel management. Olena Plokha – Associate professor, PHD, EQUAL-IST project member, female. Responsible for project results dissemination. She has great interest towards developing gender equality at University. Besedovskyi Oleksii – Associate professor, Vice-head of Information system department, PHD, EQUAL-IST project member, male. Is a person that affects the decision-making at IS department. Responsible for organizing teaching process and student services at IS department; He has deep knowledge of the unit and of the University management system. Daria Nagaivska – PHD student, EQUAL-IST project member, female. Coordinator of platform “Culture of equality” and member of NGO “Actual women” Has experience and great interest towards developing gender equality and research of gender issues. Brings the viewpoint of students for the working group. Ganna Plekhanova – Senior lecturer, EQUAL-IST project member, female. Executive head of working group. Is responsible for project results dissemination, conducting WG meetings, work organization, ensuring effective communication within the working group.